In what amounts to a lengthy ad, luxury motoring brand Bentley on Wednesday posted to the Web a "short documentary" covering the design theory and history of its cars, with the video shot and cut entirely on Apple iOS devices. Titled "Intelligent Details," the four-and-a-half minute clip highlights Bentley's Director of Design Luc Donckerwolke and Head of Exterior Design SangYup Lee waxing philosophical on the marque's latest model year Mulsanne. The YouTube video was first spotted by The Loop. 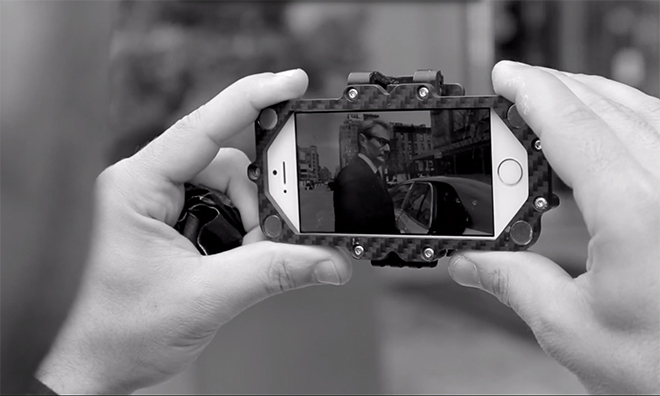 According to a short making-of section at the trailing end of the video, the commissioned mini documentary was "shot on iPhone 5s," "assembled on iPad Air" and "edited in the Bentley Mulsanne." A clever scene shows the film's editors using Apple's devices in bespoke rear seat tables integrated with the starting-at-$300,000 automobile's seats. Like Apple's own Mac 30 video, which was also shot using iPhone 5s devices, production equipment played an important role in the film's quality. Everything from automated gimbals to specialized iPhone frames, mounts and steady-cam adapters were used to capture footage. The video is actually a testament to the capabilities of the iPhone 5s' imager. Bentley didn't choose to create the video on Apple's products just for kicks, but instead to show off the Mulsanne's impressive on-board entertainment and connectivity suite. For example, the car comes with twin electrically-deployed tables that boast a hidden iPad holder and dedicated space for Apple's wireless keyboard. Available as an option, the package includes other niceties like Naim audio coponents, rear seat entertainment and a Wi-Fi hotspot. Apple's iPhone 5s was first used as a production-grade camera by Burberry, which won exclusive access to early examples of the handset to shoot its Prorsum Womenswear Spring/Summer 2014 fashion show. The resulting footage was subsequently pared down and used by Apple in the company's own ad spot.